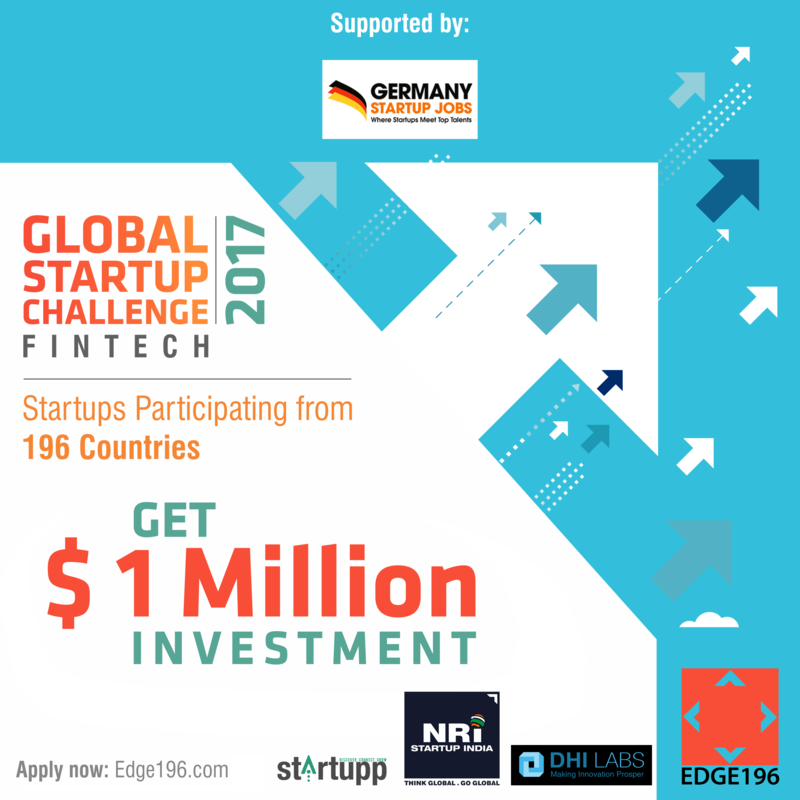 Announcing the Global Startup Challenge 2017 – an initiative of an Edge196 supported by India Startup Jobs ,official Recruitment Startup Partner to help startups and entrepreneurs go from prototype to development to launch. 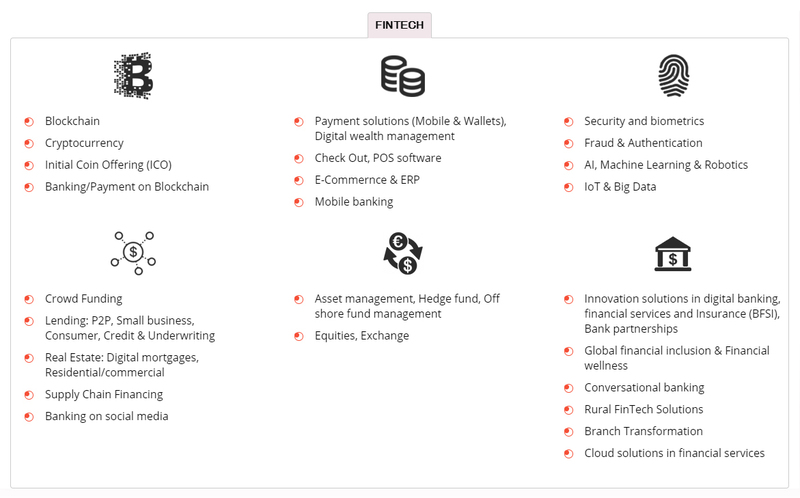 FinTech is an initiative to empower innovations & start-ups across the globe through the platform EDGE 196. The challenge runs across 26 global clusters (196 countries) where our objective is to identify start-ups that have the potential to become the next unicorn in the world. The three shortlisted start-ups are invited for online conference pitch session & the 26 winners are then offered the term sheets and provided with an Acceleration program run by one of our global partners in India, UK, Canada, Singapore, and USA. Investment Split: One winning start-up from each cluster (26 Clusters) will get an investment of 50,000 USD. And out of 26 winning start-ups, one will be selected for the grand investment of $1 Million USD. To apply you would have to answer a few questions which involve information about the date of incorporation, brief description, stage, team size, annual revenue, the amount of revenue you are looking for from investors and upload your pitch deck along with a video. Once we shortlist your startup you will be contacted by our team of analysts. Preferably with influence in terms of clients/revenue. At least 2 people working on it. Global Market Access: The start-ups with potential are facilitated and presented into the global market for broader audience. Investment: The winning start-up from each cluster gets investment of 50,000 USD to finance their project. One potential start-up across the globe gets the investment of whopping 1 Million USD. Start-up Summit: The final 26 successful start-ups are then invited to the Grand Finale to pitch their ideas. Continuity Investment: The selected start-up has the chance to raise its continuity investment through Global Investment Partners. (Investment is equity based). Problem Solving: Start-ups with a simple solution and a powerful impact. Team: Passionate founders and a team that believes in their vision. Innovation: The technology behind the original solution and future scope. Global Scalability: Sustainable startups that have scalable models. Market sustainability, business model and revenue forecast etc. The hardest part of starting up is starting out. With India Startup Jobs and Edge196, you’ll be immersed in the ideal environment for startup magic to happen. STAND A CHANCE TO WIN $ 1 MILLION INVESTMENT? Please check for your country via this link and submit your application via respective cluster pages. India Startup Jobs aim to help India‘s entrepreneurs of newly established businesses find the most qualified team member(s) and get their projects done by highly efficient professionals from India and a global pool of talents; thus, boosting their business significantly. The high-quality job portal eliminates the time-consuming job seeking, tracking, and hiring processes and matches every job giver with the right job seeker. India Startup Jobs offers locally-based startup businesses a unique opportunity to grow their business by finding and hiring the most qualified candidates through a single-step, user-friendly process. That way, new business owners can save considerable time from having to go over numerous resumes to find the right person for the job required and money spent on purchasing recruitment software while candidates can easily connect with much-promising businesses with enormous potential. According to statistics, 40% of businesses fail within the first year and nine in ten entrepreneurs that start a business fail during their first five years of operation. One of the principle reasons for this is having a poor management team. If the work done in building, implementing, and promoting a product or service is weak, and if customer satisfaction does not meet the expected standards (at least), startups are doomed to colossal failure. That aside, a weak management team builds weak teams below them, which leads to important revenue lost. Eventually new businesses run out of cash and go bankrupt. However, newly established companies cannot afford complex HR processes, but they do need to keep application tracking records without spending enormous amounts to recruitment agencies or any other highly-paid third party to find the right people and build great team.This is where India Startup Jobs come in and make the difference. Helping the local communities fight unemployment by giving skilled India‘s professionals the opportunity to get a job relevant to their skills.